Remember the title cards at the end of American Graffiti that reveal the fates of the four male main characters? Some people were annoyed that there was no mention of the female characters. I wasn’t bothered by that omission at all because the girls weren’t the focus of the story. They were just along for the ride, so to speak. It was the boys who were becoming men after a long night of drag racing, pranks, and self-discovery. But I was deeply troubled by the glaring omission at the end of The Pursuit of Happyness. 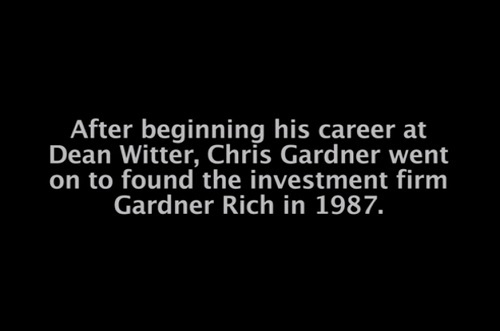 It ends with a couple of title cards revealing the happy fate of its protagonist, Chris Gardner. He went on to earn a great fortune and build his own brokerage. He certainly deserved to after all the hard work he put in and everything he suffered along the way. But what about his son? Why didn’t we learn his fate, as well? 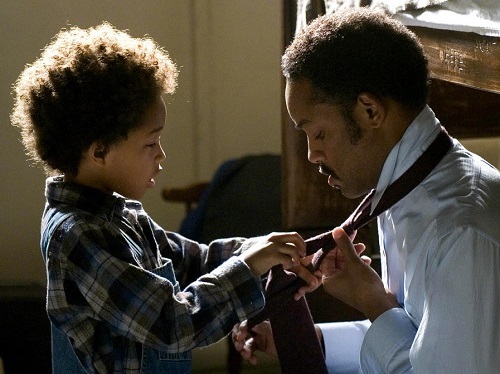 The Pursuit of Happyness focuses on Chris Gardner’s relationship with his 5-year-old son, Christopher. Everything goes wrong in this film for Chris. His wife abandons him and their son. He gets arrested over unpaid parking tickets. He loses all of his money and gets evicted from his apartment. He’s forced to take refuge in a subway bathroom and then a homeless shelter at a local church. And he has to compete with 20 other highly qualified applicants for a stockbroker job while working for free as an intern. The whole way through, though, Chris refuses to abandon his beloved son. He wants Christopher to grow up with his father, which is something that he didn’t get to experience himself. Sadly, many young men in America don’t get raised by their fathers because of divorce, death, or abandonment. This is leaving a gaping hole in many men’s psyches as they struggle to navigate adulthood. Chris wanted to make a better life for his son. Everything he does in the film is to try to hold onto his family and bring them through those scary times. It’s inspiring to see him fight and pursue not only his own happiness, but the happiness of his son. So what about his son? Why doesn’t the film provide any closure about his fate, even though the events of the film take place in the 1980s and the film came out in 2006? So Christopher would definitely be an adult by then. I love that the film stars real-life father and son Will Smith and Jaden Smith. Their relationship on screen is heightened by that fact. (Note: I forgot to fact-check this part, and actually, it looks like Will Smith is still married to his wife, so I apologize for that error) It’s been 10 years since this film debuted, and it’s a little sad to see how Jaden has disintegrated into just another attention-seeking former child star. By leaving out any information about young Christopher Gardner’s life as an adult, it leads me to worry that he didn’t enjoy much success like his father. Maybe they drifted apart over the years and the son didn’t want his current situation being mentioned in the film. Or it could be that he was just a typical young man in his twenties with nothing much accomplished at that point in his life. But it still would have been nice to hear that he’s alive and attending college or going into a certain field of work. The Pursuit of Happyness isn’t just about Chris Gardner. It’s about what happens to his son, too. At least I thought it was until the very end of the film. This is kind of a big deal to me. I (along with my eight brothers and sisters) was raised by a wonderful mother and father. My father worked hard and sacrificed a lot to keep us all together and happy and healthy. I’ve had a great life thanks to the stable foundation he helped create for me, and now I’m passing on everything I’ve learned to my own three wonderful children. If a movie was made about my father’s struggles to overcome significant challenges in his life, I’d hope I’d warrant at least a mention at the end as one of the happy fruits of his labors. My point is that The Pursuit of Happyness tells the story of a father who refused to abandon his son – and yet it feels like the movie does abandon him. To right this wrong, I’d like to share a little bit about Christopher’s fate. Here is a video I found of Christopher sharing what he is doing with his life. He and his father are still working together, making independent films. Isn’t that awesome? Of course, that was six years ago, so I don’t know if that panned out for him. But he looks like a totally decent, humble man who is striving to live up to his father’s legacy. That’s all I needed to know. My pursuit is over, and I’m so relieved to know that Christopher Gardner is happy. This entry was posted in Random Stuff and tagged american graffiti, fathers, movies based on books, parents, pursuit of happyness, sons, true stories, will smith. Bookmark the permalink. What a nice thought provoking idea:) I’m glad to hear that Chris grew up to be happy and healthy.